South-by-Southwest Interactive (SXSWi) kicks off here in Austin on March 7 and I'll be speaking that day as part of a live web broadcast! 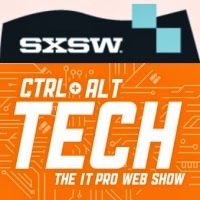 Well, to be accurate, the broacast *is* tech related and is happening *in* Austin and is sponsored by a tech company with worldwide presence on the *same day* that SXSWi begins so technically that's a SXSWi-related event...right? Or at least an "unsanctioned" SXSWi event? Maybe just a little...? Part of the live broadcast will feature my own sweet 1981 Apple Profile hard drive. Not only was the Profile Apple's very first hard drive product but, inside, it included Seagate's very first hard drive product which also happened to be the world's very first 5.25-inch format hard drive -- the drive that set the sizing standard for PC hard drives these past 35 years. Check back for my follow-up post where I'll share details and a photo or two from the webcast's Profile-related segment.